A ridge north of the islands will maintain the fresh to strong trades into early next week. The Small Craft Advisory will continue at least into early next week for the typical windier areas near Maui County and the Big Island. Anticipating a bit of an uptick in the trades Saturday, so the SCA was expanded earlier to include windward coastal zones near Maui and the Big Island as well as the Kaiwi Channel for Saturday and Saturday night. 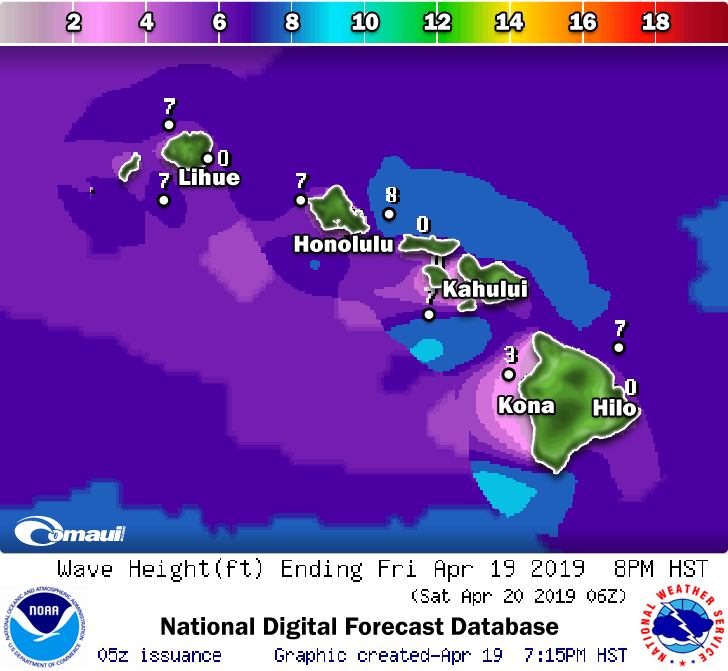 Surf along all shores is expected to remain below advisory levels for the next week. The current north-northwest swell is on the decline, and is expected to continue declining through the weekend. A small, west-northwest swell is possible early next week. Background south-southwest swells will keep surf small along south facing shores through the weekend. 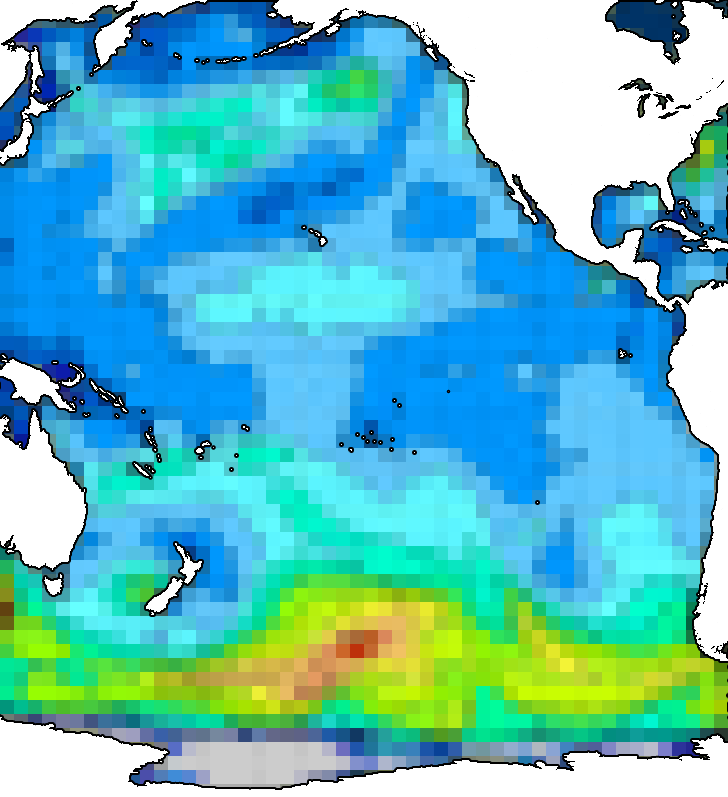 An upward trend is possible early next week, due to recent activity southeast of New Zealand. Surf along east facing shores could see a bump over the weekend with an uptick in the trades. 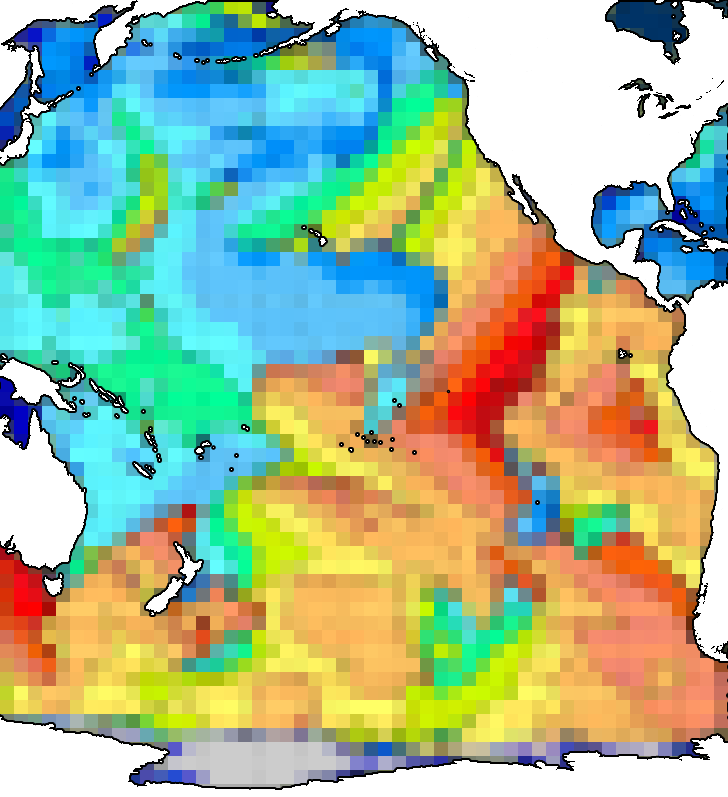 See the latest Oahu Surf Discussion (SRDHFO) for additional details on surf and swell. The sunrise was at 06:01 am this morning and will set at 06:47 pm this evening. The Moon is currently 16 days old, and is in a Full Moon phase. The next Waning Gibbous will occur at 10:19 PM on Friday, April 26th. Seasonal trade wind conditions will prevail through the weekend and much of next week as high pressure remains in place to the north. Clouds and showers will favor the typical windward locations each day. The latest surface analysis showed a 1029 mb area of high pressure centered over the northeast Pacific and a ridge extending west- southwest from it to an area north of the islands. Water vapor imagery showed a ridge positioned over the region and mostly dry air aloft. Satellite and the afternoon upper air soundings showed moisture levels near to slightly below normal for this time of year and a strong subsidence inversion between six and eight thousand feet. Rain gages support the dry conditions with minimal accumulations measured over the past 12-hrs (through 6 PM HST). Peak totals for this period have been on the Big Island along the windward coast from Hamakua to North Kohala (.25 to .88 inches). Guidance supports the mostly dry and stable trade wind pattern to continue through much of next week. Trades may trend up over the weekend due to the ridge strengthening north of the islands. Breezy conditions will result, especially through the late morning and afternoon hours. The upper ridge is forecast to remain over the region into next week with mostly dry mid- to upper-level air holding in place. These upper conditions combined with a strong subsidence inversion will limit the rainfall potential/coverage, even for windward locations. The exception will be due to pockets of higher moisture moving through periodically within the trades, which will translate to better windward rainfall coverage. For the extended period, guidance depicts lowering upper heights and the ridge to the north weakening due to a weak shortwave trough and surface front moving into the region late next week. Forecast confidence this far out remains low, but if this scenario does evolve, trades would trend down, potentially becoming light and variable for some locations. Sunny and breezy. Highs 81 to 86. Northeast winds up to 25 mph. Breezy. Sunny with isolated showers. Highs 79 to 86. East winds 10 to 25 mph. Chance of rain 20 percent. Breezy. Mostly sunny with scattered showers. Highs 70 to 83. East winds 15 to 25 mph. Chance of rain 50 percent. Breezy. Partly sunny with showers likely in the morning, then mostly sunny with scattered showers in the afternoon. Highs around 82 at the shore to around 65 at 5000 feet. East winds 10 to 25 mph. Chance of rain 60 percent. Sunny and breezy. Isolated showers in the afternoon. Highs around 86 at the shore to 65 to 71 upcountry. East winds up to 25 mph. Chance of rain 20 percent. Sunny and windy. Scattered showers in the morning, then isolated showers in the afternoon. Highs around 59 at the visitor center to around 56 at the summit. East winds 25 to 35 mph. Chance of rain 50 percent.